What a wonderful trip it was! I discovered a truly beautiful city with breathtaking architecture, history, art, style, opulence and was extremely impressed. 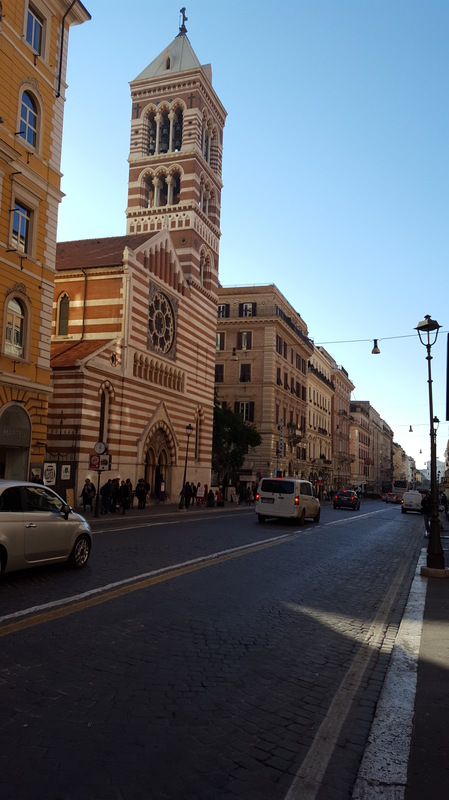 After a long day of travel on Saturday, settled into the one bedroom apartment off the main road, Nazionale, which was immediately enticing with its opulent buildings, shops and restaurants and so full of life. This area is a great place to stay because it is walking distance from the main Stazione Termini. The apartment was secured from the website Air BnB and well located because central and handy for the Metro. Obviously, it is better to walk and explore the winding lanes and magical surroundings of Rome. 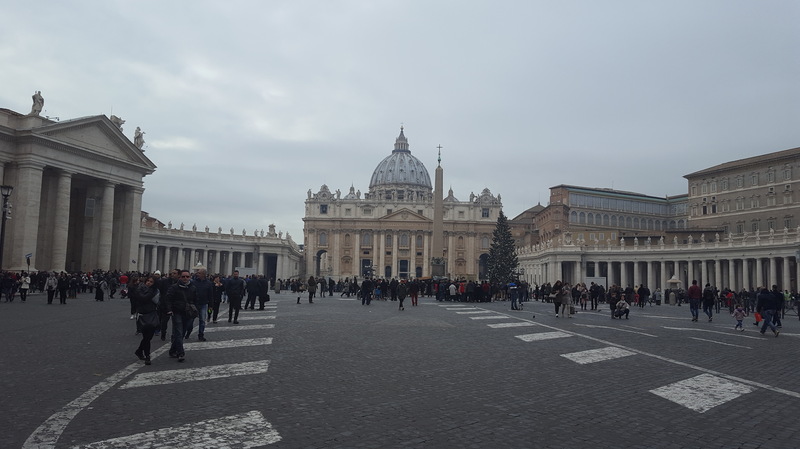 The first day we started by visiting The Vatican and because of a long day on Saturday, deemed it impossible to rush out so we didn’t arrive until about midday and probably missed all the drama of the Pope (we think) but it was still an amazing experience. Vatican city (Citta del Vaticano), the papal residence, was built over the tomb of Saint Peter. 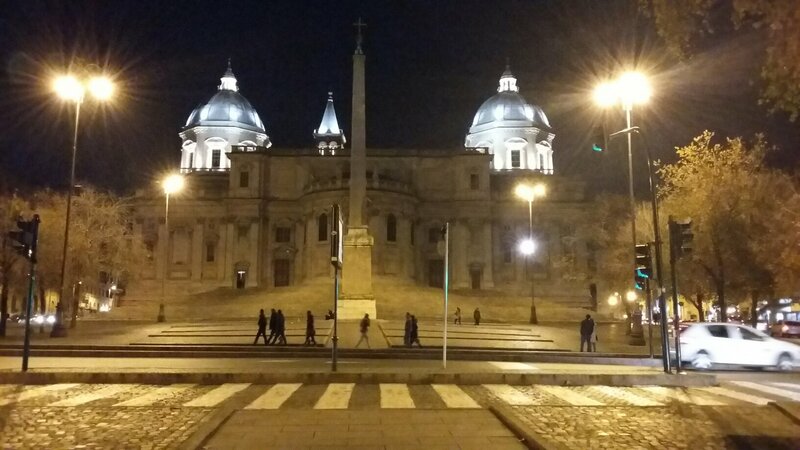 The Vatican’s position as a sovereign state within a state was garenteed by the Lateran Treaty of 1929, marked by the building of a new road, the Via della Conciliazione. It has been the residence of the popes for about six centuries since 1377 and is an independent state ruled by the Supreme Pontiff (the Pope). The evening was spent in the lively Irish pub, The Flann O’Brien, situated on the Nazionale which had a keyboard player/singer and lots of dancing ensued. A fabulous start to our week long break. We visited the Trevi Fountain on day 2. The weather was blue sky and sunny, although a chilly 16c, a lot brighter than the UK. 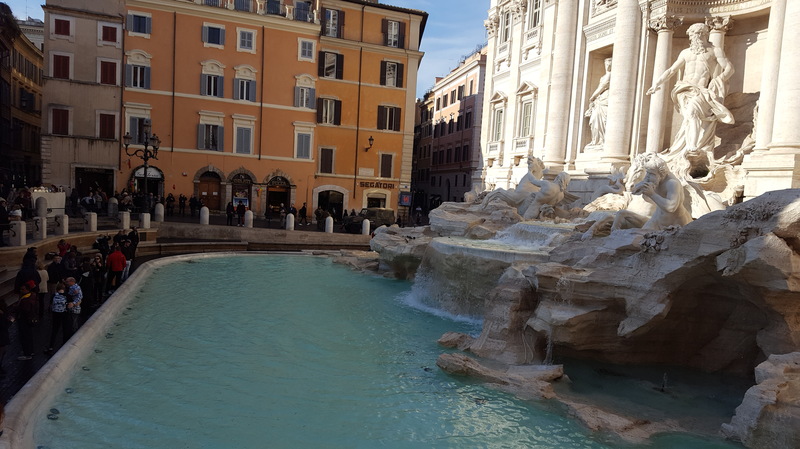 We duly threw in our coins into the Trevi Fountain, which traditionally ensures your return to Rome. The Trevi fountain, inspired by Roman triumphal arches, is the largest and most famous Baroque fountain in Rome (standing 25.9 meters high and 19.8 meters wide). My pictures are not great, because it was very bright. Goodness knows what Rome is like during the summer months because it was still fairly busy in December. 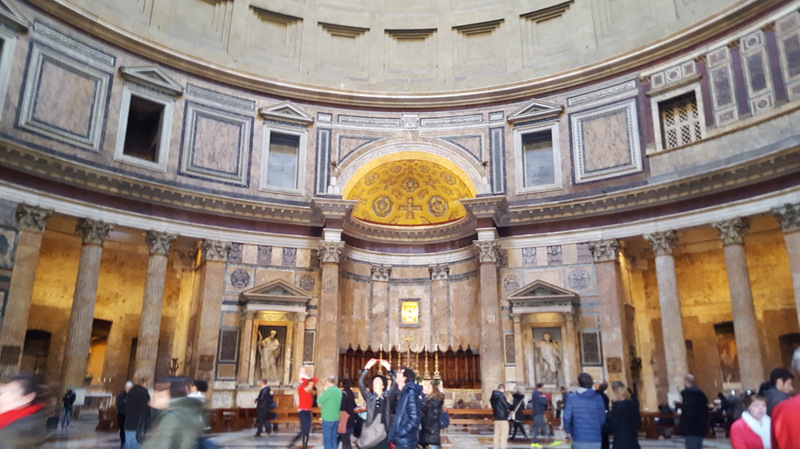 During day 3, we frequented the truly amazing Pantheon. This place is stunning and was one of the most impressive sights I have experienced. It is well preserved and is an unusual experience as you gaze up to the delights of the largest unreinforced dome ever built. The temple is the only monument in classical style which can be found intact in Rome. The word Pantheon is a Greek adjective meaning “honor all Gods” was first built as a temple to all gods. Spectacular and not to be missed if you visit Rome. Well, day 4, was incredible and quite an exhilarating experience. We took the metro a couple of stops to The Colosseum. This has to be seen to be believed. An immense amphi-theatre and bizarrely the first sight you see as you leave the station. 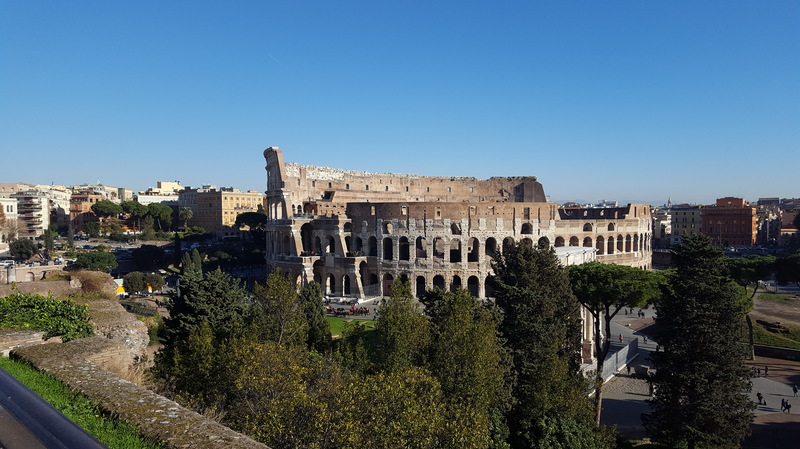 The Colosseum, originally known as Flavian Amphitheatre, was commissioned in AD 72 by Emperor Vespasian and completed by his son, Titus, in 80, with later improvements by Domitian. What is impressive is that it is still there at all. It is located east of the Roman Forum and has 80 arched entrances for 55,000 spectators. The Colosseum is huge and as you explore you can almost hear the cheering of the ancient, ghostly crowd. Quite an extraordinary encounter with the past which leaves an impression. 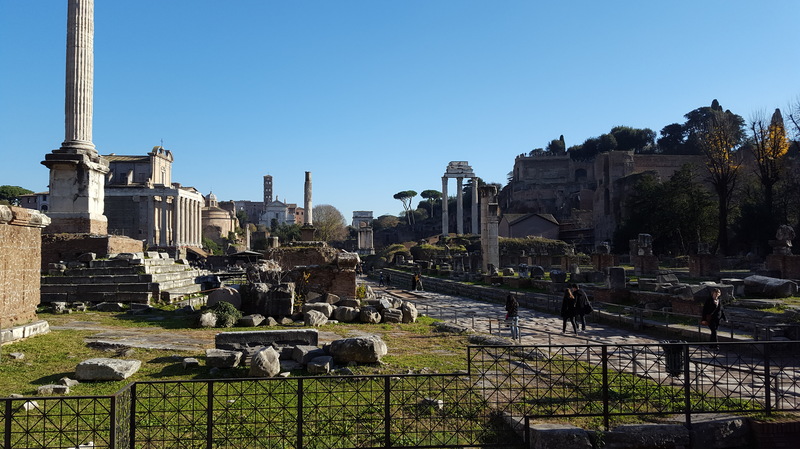 This was further endorsed by a wander around nearby ancient ruins of the The Forum and this also evoked more impressions of the power of the Roman empire. During the week we visited many areas of Rome, including The Spanish Steps. 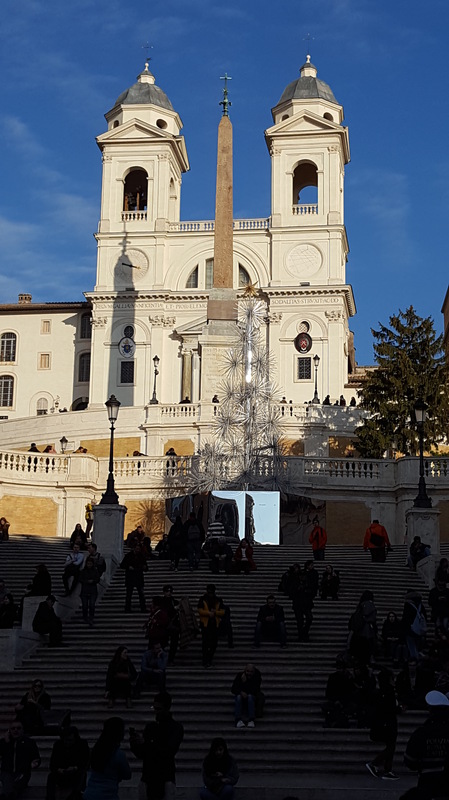 The square and the church are connected by the monumental Spanish Steps, built between 1723-1726 (designed by Francesco de Sanctis). It is a busy area with many people sitting on the steps and enjoying the ambience of Rome. If they were like us, they were probably exhausted because you walk miles. But it sure is worth it. We then wandered around the rather grand area and nosed in the designer shops. Some very expensive handbags there. On our last day, we decided to visit the Baths of Diocletian. The visit was a last minute decision and very well received. The baths were built 298AD and 306AD to honour Roman Emperor Diocletian. The complex is large and was once one of the biggest in the world. 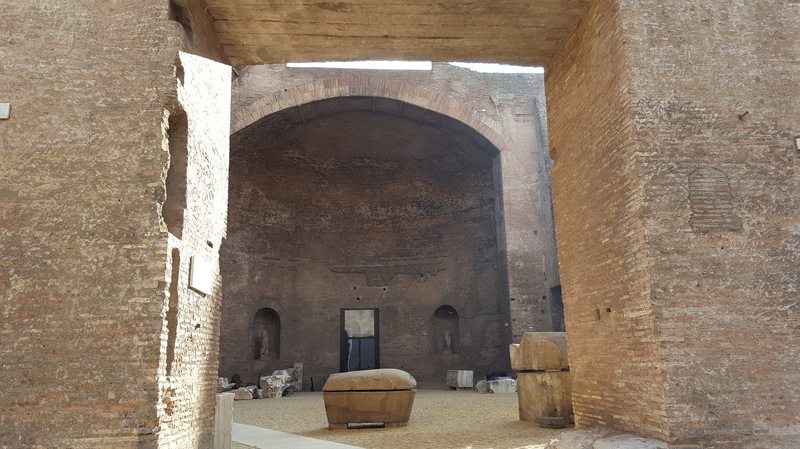 It had a frigidarium (cold room), tepidarium (warm room) and caldarium (hot room or steam room) as well plus large bathing chambers, gymnasiums and even a library and held up to 3,000 people. As you enter the baths there is a small auditorium where you can watch a video about the Baths of Diocletian and includes a computer animated section, demonstrating how they think the baths were in their heyday. If you visit the baths, make sure you watch it because it is fascinating although, in my opinion, probably they were not that grand. As you walk around the beautiful city you pass some pretty areas and as it was December we were impressed by the lights and decorations. Of course, we devoured plenty of pasta, meats, fish, pizza, wine and beer in some great family owned restaurants and bars.